By now, surely you’ve heard the awesome news that Sarah Palin launched her own subscription-based online network — The Sarah Palin Channel — where everyone’s favorite half-wit can reach her huddled masses directly and bypass those pesky “politically correct” media filters. And it’s only $9.95 a month! When we heard the news about PalinTV we got pretty excited. We’re paying a fortune to Time Warner Cable for 665 channels of drivel; why not make it 666? And you gotta respect Palin’s faith in the free market. If she’s giving the people what they want — with the trivial exception of health care, reproductive rights, gay marriage, fifth-grade science, or common sense – well, that’s what America’s all about! Can’t possibly do any harm. It might even be fun! Some of America’s most cherished shows have been comedies and science fiction. 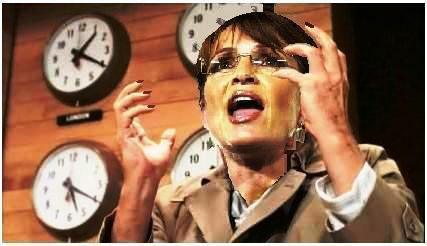 So, if she sticks with what she knows best, how can the Palin Channel go wrong? Well, here’s a problem. As anyone who’s ever worked in media knows, you need variety. Finding good and varied content is by far the most enduring challenge of any media enterprise, and it takes a village of twelve-year-olds to come up with ideas. But, it turns out, Palin is responsible for all the content of her namesake channel. Period. We haven’t gone behind the pay wall yet, but, if it’s going to succeed, Palin’s internal brain trust will have to do better than what its homepage (sarahpalinchannel.com) suggests. It’s populated with filler like a “Word of the Day” feature and a cynical “countdown clock” to the end of the Obama administration. And, as The New Yorker (which generously went behind the pay wall) points out, the Palin Channel so far relies too heavily on clips like ones where Palin reads a story to her son, or pops up in her kitchen to discuss vegetables. That’s less compelling than a dead deer on the roof of a jeep. Palin’s concept of programming is why top media execs down fistfuls of high-blood-pressure medication with their liberal-elite grande iced half caf triple mocha latte macchiato every morning. But fear not! Governor Quit is never far from spewing new ideas. And we have proof. We were fortunate enough to get a sneak peek at the Palin Channel’s development slate. We can’t say for sure that all of these shows will make it past infancy or make the Palin Channel a powerhouse media giant, but we can hope. We want the Palin Channel to succeed! If Palin is up to her schoolmarm glasses in spec scripts and tedious production meetings, she’s too busy to be on the streets shouting that Shakespeare made up just as many words as she did. So take a gander at this sneak-preview peek of all the shows being considered — and remember: Palin herself is overseeing the content! OK, now: tell us which show would make YOU want to subscribe?